Leadership skills appear to be an important element in creating and maintaining a culture of creativity. 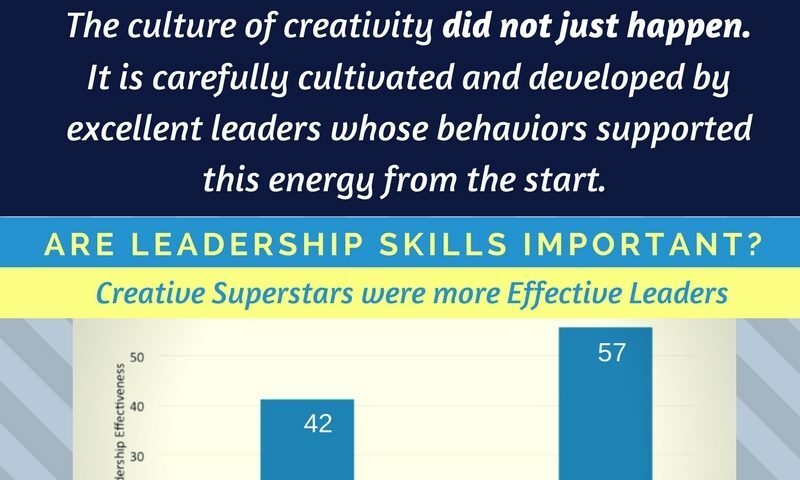 By analyzing the data comparing the creative superstars with other leaders and discovered 13 behaviors where there was a statistical difference between the performance of the two groups. We then factor-analyzed the 13 behaviors and identified the six key capabilities that differentiated these creative superstars from the rest of the leadership pack. Creative Superstars Know how to inspire? The creative superstars were slightly better at driving for results. Often we refer to this competency as “push.” But in the graph below, note the difference you see on the competency “inspires and motivates others.” We refer to this competency as “pull.” Creative superstars know how to inspire. They create energy in their teams and with clients. While they are effective at setting deadlines and delivering projects on time (push behaviors) the thing that sets them apart from others is their ability to energize and motivate others (pull behaviors). It’s clear to us that especially in creative jobs, the ability to inspire others is critical.